What trousers do I need? You will need trousers incorporating chain clogging material. These are normally identified by a shield with a chainsaw inside it. For ground-based chainsaw courses you are supposed to use type c trousers; once you have passed you are able to use type a. Type c are classed as occasional and professional user chainsaw trousers (a person on a training course is classed as an occasional user). What does class 1, 2 and 3 mean? Chainsaw wellies or chainsaw boots? If you are only cutting occasionally then chainsaw wellies are fine, you just need to be aware that they are heavy and awkward to move about in. If you are going to be working with a chainsaw on a regular basis, then chainsaw boots are more comfortable and enable you to progress on to climbing units without having to buy a second pair of boots. Do I need chainsaw gloves? The use of gloves is recommended not only for chain protection but to limit hand / arm vibration damage and protect you from thorns. For the initial chainsaw maintenance, cross cutting 20-03 (formally CS30) and the felling and processing of trees up to 380mm 20-04 (formally CS31) chainsaw gloves are strongly recommended due to the extra protection on the back of the left hand. Once you’ve passed the choice is yours however you need to consider the working conditions, the environment you’re in, the requirements of your company and the risk assessment. Should I carry a personal first aid kit? You should always carry a functional first aid kit. The minimum is a large wound dressing but there are some very good small kits on the market. You will however be provided with a personal first aid kit on the courses you attend with Lowe Maintenance, so you don’t need to buy one in advance. Which helmet should I choose? If you are ground based only, you need a forestry helmet that complies with BS EN 397, BS EN 14052 or BS EN 12492. The BS EN 12492 is suitable for the ground when there is nothing in the task risk assessment to disqualify it. If you are climbing, you’ll need a climbing helmet that complies with BS EN 12492. What is the life of a helmet? The finite life of a helmet used to be 5 years from date of manufacture but it is not so simple now. It’s best to look at manufacturer’s info to find out the use and the finite life of your helmet. Do I need a cutting jacket? Depending on the company or organisation you work for, you will not need a cutting jacket, they are available but it’s more down to personal preference than HSE requirement. Should I have a first aid qualification? The nature of working in the outdoors with limited numbers of people to assist, means it would be in your best interest to get a first aid qualification and it is also highly recommended. The +F on a first aid course means you have also had training specific to the forestry industry, it is worthwhile as it means the course is scripted specifically for your industry. Can I wear a woolly hat under my helmet in cold weather? Being a bald man, I know it is a bit cold first thing but it is not good practice to wear a hat under your helmet as it interferes with the fit of the straps. The most you should wear under your helmet is an industry approved liner or a thin skull cap, to limit interference with your helmet fit. What’s the difference in chainsaw footwear? All chainsaw footwear must comply with basic design and manufacture regulations. Along with the chainsaw blocking material they must have protective toe cap, be well fitted and have a good tread. The blocking material layer is sandwiched between the outer and inner layers of fabric which is why some boots seem larger than your usual size footwear. There are new materials coming in such as: aluminium toe caps; reformable caps and thinner more advanced blocking materials, this is making chainsaw boot design very interesting. There are so many different makes and models out there, if you can it’s best to try on a few different pairs to see how they feel. Can I wash my chainsaw trousers? It is advisable to always wash your chainsaw trousers following the manufacturer’s directions. You tend to get very hot in cutting pants and this can leave a lot of bacteria living in them which will make things a lot worse if you have an accident. Also tree resins, sap and bio hazards are an everyday part of the work so yes, you really do need to wash your trousers! Can I put my chainsaw trousers in the tumble dryer? Follow the manufacturer’s directions when it comes to drying them. The use of a tumble dryer may damage the way the layers are sandwiched in the trousers – it’s not something I would do. If the outer fabric of my chainsaw trousers is damaged can I still wear them? Try to repair the fabric the best you can, making sure you have not damaged or trapped the inner layers whilst doing so. If any of the inner blocking material is pulled out or damaged (even a little bit), it will interfere with the safety of the trousers and they should be replaced. You need to take care of your chainsaw trousers. What communications methods should be on site? There is a vast array of coms available these days, if your mobile does not work then make sure everyone knows where the nearest land line is in case of emergencies. It does depend on the site and your own risk assessment requirements. Do I need a whistle on site? A whistle only works if everyone knows what it is for so make sure everyone does know. There are sites where if you blow a whistle everyone thinks it brew time which can extend reaction times and thus help coming. Should I wear a hi-vis? The site you are working on will dictate dress codes, if not then common sense should be used. If you are near machinery or traffic and so you want to be noticed, then yes wear a hi-vis. Can I wear chaps / spats? Chaps are not designed for long term use they are more for the occasional user perhaps using a sawhorse on a hard surface. The same goes for spats, they are only for use on flat surfaces where it is easy to see if the spat has folded back on itself while moving about, they are not for full time forestry use. You wouldn’t be able to attend a course or assessment using chaps or spats. Can I wear waterproofs over my chainsaw trousers? Yes, it is advised to keep the chainsaw trousers dry as they are very heavy when wet and this adds to the stress of a busy day. What type of ear protection can I wear? Hearing protection to BS EN 352 is required unless you are going to be using a chipper as well, then you may need a slightly better pair or use earplugs as well as the ear defenders. Can I wash the inside of the ear defenders? You can’t wash them but you can get hygiene kits if you think the ear capsules are getting a bit manky, they are fairly easy to change. What safety features are fitted on a chainsaw? These are the standard safety features but there are others, it depends on make of chainsaw. There may also be other adaptations of these features. Why do I need a maintenance course? It’s easier to follow someone showing you how to maintain your chainsaw than to read the manufacturer’s instructions, also the odd little quirks with each chainsaw’s maintenance can be explained in more detail. If you want a certificate of competence, the trainer can steer you through the standards required to pass the test. Some stickers are missing on my chainsaw, is this a problem? All stickers on a chainsaw are required to be legible and fully in place, there are some that provide specific information and are classed as an insurance / HSE fail if they are not in a good readable condition. How long can I leave fuel in the tank? An alkylate fuel is very good and can be left for a long time. However, if you are using a self-mix two stroke fuel, don’t leave it too long as it can separate, and this is not good for the cylinder. How do I know I’ve got the right chain? If you have a chat with your supplier, they might advise you. It depends on what you plan to do with it, what you are cutting and how often. The user manual will also have information as to type and size of chain. If you attend a Lowe Maintenance course all will be explained in detail with different examples shown. What products can I use to clean my saw? Most suppliers will have a good cleaner available or an industrial wet wipe cleans most oils and resins from your chainsaw. Have I got the right sharpening kit? If you find out the size (pitch) of your chain, then you can order the correct sharpening kit or file to match the chain. You would be shown this during your chainsaw maintenance course with Lowe Maintenance. How often do I clean or change the fuel filter? The fuel filter is a micro pore filter and can’t really be cleaned so if it is looking badly stained or you are having problems with the saw then replace. However, a good clean fuel can keep your filter going for a number of years with no problems. What’s the difference between semi and full chisel chains? A full chisel chain is more aggressive cutter and used normally for fresh cut wood and pines, it processes wood very well. Although a full chisel can lose its edge easily because it is so aggressive. The semi chisel is not as aggressive and is used as a general-purpose chain and, depending again on what you are cutting, it can keep its edge a bit better. Our workbooks, provided during the chainsaw maintenance course, demonstrate this with illustrations. What size bar and chainsaw can I use once I’ve got my ticket? There is no restriction on bar and chainsaw size it’s down to being able to handle it safely. Bigger chainsaws are heavier and longer bars are harder to control, it’s down to getting the best tool for the job and being able to control it. What oil should I use? Always use a chainsaw oil (not any old engine oil) as the chain oil is designed to stay on the chain for as long as possible and has a very good viscosity when hot. If you are only logging up in a yard for personal use or as a domestic user with the wood on a saw horse, you can wear ear defenders and eye protection, as you are not classed as a professional user. If you are entering a forest this is classed as a work site, then you should be wearing a helmet to limit injury from falling objects. What fuel should I use? It depends on your budget, the alkylate fuels are very good and better for your lungs and the environment but can be expensive if you are using a lot. Normal unleaded petrol is cheaper but has several health issues with it. It may be that the contract or site owner has a preference in which case you may have to follow their guidelines. What size is my chain? If you mean length, then it may be stamped on the guide bar or in your user manual. If you are looking for cutter size, then again it may be on the bar or in the user manual, if you are struggling you could speak with your local dealer. How do I clean my air filter? If it’s a nylon filter, then it can be washed in warm soapy water and left to dry, before putting back on. If it’s a paper or fibre filter, then it cannot be cleaned and has to be replaced if heavily covered with oil. How often should I change my sprocket? The average time to change the sprocket on the chainsaw is two to three full lives of a chain or if the teeth of the sprocket are showing signs of wear and the wear is deeper than 0.5 millimetres. Should I store my saw with the brake on or off? The best method is to store the chainsaw with the chain brake on due to the nature of the brake spring and the force it is left under when the brake is off. How do I change the pull cord? Some user manuals will describe how to change the cord; you could attend a training course where part of the training involves replacement of the cord. In most cases it is not overly hard to do, a bit fiddly but possible. How often should I turn my chain bar over? Best practice is to turn the bar over every time you maintain the saw to even out the wear and prolong the life of the bar. Why should I take care of my guide bar? As the name suggests the bar guides the saw through the cut, if you do not maintain the bar then you will find it harder to cut straight and the bar may fail in a way that can be dangerous to the operator. What are the signs of a blunt chain? If when you are cross cutting and the wood coming from the chain is like dust not little square chips or you find you are having to push harder on the saw to cut, then it is time to look at how sharp your chain is. I only need to log up for the home fire, do I need a full course? You can do a bit of formal training but not book for an assessment. If you are cutting on your own land and don’t have a need for insurance, then there is no need for a full course. There are several insurance companies that will only be happy with formal training. If a certificate of completion is provided, with a date and list with what was covered on the course, this can demonstrate an element of competence. Can I bring my own chainsaw? It is always best to bring your own chainsaw to the course, if you have one so that you get used to maintaining it. However, if you are doing a number of courses we can supply a chainsaw for each course so that by the end you will know what might be best to buy. Who needs the felling trees up to 380mm (CS31) ticket? Foresters, arborists, farmers, landscapers, gamekeepers, greenskeepers, smallholders and people with a private woodland etc. If you are cutting saplings on a regular basis and the size starts to creep up, you will very quickly end up with the size of tree that needs a bit more control and thought to fell it. The course teaches you how to read the tree and work out what you can and can’t do and how to work safely. What cuts will we be covering? However, if you do a course with Lowe Maintenance we can provide a lot of the kit, you just need your own pair of boots and a pair of gloves for hygiene reasons. Do I have to wear chainsaw gloves? Do I have to be strong to fell trees? No, it’s not a matter of throwing wood about, you use your head and think problems through or seek assistance if required. Yes, and very well. The chainsaws are now much lighter, the equipment is much more user friendly and most women are tough. They are also very good at thinking a problem through and not just fighting with the tree. Yes, wellies are fine they are designed for the job and comply with the industry footwear regulations, they just aren’t very comfortable and tend to be a bit big and bulky. What if my chainsaw gets stuck? Whilst on a Lowe Maintenance course you will be shown how to deal with getting your chainsaw unstuck, obviously once you have switched it off! By the end of the course you’ll know exactly how to deal with the situation as you’ll be reading the tension and compression during cross cutting. Do I have to do chainsaw maintenance and cross cutting ticket first? Some people do each unit one at a time, however you can combine the chainsaw maintenance and cross cutting 20-03 with the felling and processing up to 380mm 20-04 and complete both units in the same week. How do squirrels affect felling of trees? Some of the sites we use have red squirrels and when it is breeding season we must stay away from that area. It’s not just a matter of felling the trees that don’t have squirrel drays in, it’s the sound and movement that can disturb the whole site. Is there a difference between soft and hard wood when felling? Soft wood is mainly pines and hard wood is mainly used to describe a broad leaf tree like beech, oak etc. There are slightly different techniques to processing the timber which you will be made aware of during your training. How do I deal with the brash? Tidily, stacked with the butts to one end in case a chipper is going to be used later, the last thing you want to be doing is fighting with the brash pile because it was badly stacked. It’s the forces that can build up in a piece of wood, if you take a broom handle and bridge it across two points, then put a bit of weight in the middle you will see the handle bend. The fibres at the bottom of the handle are being stretch or put under tension and the fibres at the top are being compressed. With a tree it’s not quite as easy to read, however, if you get it right you are less likely to get your chainsaw stuck! Do I need a felling bar? They are a handy tool to use in the woods, for lifting and rolling wood. We provide felling bars for the courses, in case you don’t need it after you take the course; it’s a waste to buy one just for a week’s course. Can I use a cant hook or tongs? There is a cant hook already fitted to the felling bar and tongs are provided to limit arm strain when moving logs, both are very handy to have in the working environment. Do I have to stack the timber? It depends on the size of timber we are cutting, not just diameter but length too. You will be shown safe methods of manual handling on the course; however, you could always ask for assistance too. Leaving a site nicely stacked ready for extraction shows a level of professional attention to detail that may get you more work in the future. How many trees will I be felling during the course? There is no limit, each tree you fell will add to your knowledge and ability to fell properly. If you just rush around cutting and not being carefu,l then you won’t learn anything and will tire easily. If a tree you are felling does not fall to the ground but gets stuck in a neighbouring tree, then it is called a hung up tree. How do I deal with a hung-up tree? There are a few methods you will be shown on a course with Lowe Maintenance, how to modify the hinge and either twist out or remove the hinge completely and pole it backwards. How close to the ground do I have to cut? If you cut close to the ground, you maximise the amount of wood extracted. It is also safer to cut close to the floor if anything goes wrong the more of you that is below the hinge then the more gets hurt. Industry standard would also encourage you to cut as close to the ground too, high cuts could result in lost future work. Can I still fell trees in the nesting season? If you have surveyed the site and are sure there are no nests, then you are okay to cut. However, you must not hit occupied trees while you cut even if the bird is on the vermin control nest you can not disturb a nest that is in use. Do I have to be strong to climb trees? There are several systems used these days to climb trees and there is no requirement to be built like a brick privy. We do taster days and introductory sessions by arrangement so you can have a play in a tree before you book for a course so that you have an idea how physical it can be. I’m not sure I’ll like climbing can I have a go first? We advise candidates to come and have a go before they book on a course as it is not for everyone and it is best to try a little bit before you book. So, feel free to get in touch and arrange an introductory session. I want to be an arborist, what tickets do I need? There are a lot of tickets in the industry so it’s not easy to say. However, there are a lot of companies out there who will give you an extremely long list that would cost a lot of money. You need to consider that your ability and knowledge should grow as a tree does slowly and surely. To get you going and working then chainsaw maintenance and cross cutting 20-03 (formally CS30) and felling and processing trees up to 380mm 20-04 (formally CS31) and safe use of manually fed woodchipper, these will get you started and into the industry. You can then progress onto the climbing units such as tree climbing and rescue 20-13 (formally CS38), this steady building of certificates will give you an idea about the industry. However, it is not just about the short course qualifications, it is advisable to book on an arboricultural course such as the RFS, be it online or at a local college, to learn about the science behind the trees. Can I use lock jacks or spider jacks on the course? There is nothing to stop you using them but courses are normally run using the basic friction devices as not everyone can afford these more expensive pieces of equipment. Having a standard system during the training makes the rescue situations easier to understand, however if you are going to use lock jacks and spider jacks it is extremely important everyone in your team understands how to use them. What are the main knots I’ll need to know? How can I practise my knots before the course? Will I be using a chainsaw on the tree climbing course? There is no requirement to use a chainsaw in a tree during the climbing course, that however does come later in the aerial cutting of trees with a chainsaw using free fall techniques 21-08 (formally CS39), that’s when you’ve passed the tree climbing and rescue 20-13 (formally CS38). Can women climb trees too? There are several very good female tree climbers; women often have a very good muscle to body weight ratio and are methodical in their work so there is no reason why not. Women currently climbing in the industry include: Boel Hammarstrand, Rachel Smith, Eva-Maria Mauz and Annalize Wright to name just a few. How do I recognise if a tree is occupied? There are a number of leaflets about this, one is provided by the Bat Conservation Trust ‘How are trees important to bats’ and if you look at their website http://www.bats.org.uk you will be able to download lots of good information. You could have a tree survey done if you are worried. What harness should I choose? It is hard to describe the best harness as every person is built differently and really you need to try before you buy. This is easier said than done but if you ask around you may get some good answers. A very important point to note, is once you have bought your harness you must fit it correctly, there are lots of straps and buckles that need fitting specifically to you. We have several different harnesses for people to use on Lowe Maintenance’ tree climbing courses. You can see which feels better for you, this will help you to make an informed decision. Can I climb a tree that has bats in it? This is not good practice but it is also not that easy to spot an occupied tree. If you know it to be occupied, then the answer is no as you may disturb the roost and that can be a bit expensive in the form of court actions and possibly your professional reputation. What is the difference between 2 and 3 way karabiners? A double action karabiner means it has two motions to close the gate and make it secure, these are easily opened and have been known to open due to rubbing on the trees and branches. This is why they should not be used as part of the life anchor points in the climbing system. The triple action has three motions to close the gate. The triple action is the only karabiner to be used as part of the life anchor point as it is harder to open accidentally. Do I need to wear chainsaw PPE when on the climbing course? No, you only need to wear a pair of work trousers and stout work boots with ankle support. You can if you want to or if the weather is a bit cold but there is no chainsaw use so therefore no need for cutting pants. Do I need another qualified tree climber on site when working? It is advisable that you have another climber on site in case something goes wrong. It takes time for the emergency services to respond, that second climber can get to you quicker and shorten the time it takes to get proper help. What is the smallest branch size I can climb on? The branch size depends on the characteristics of the tree and its condition. The branch must be strong enough to take lateral forces as well as supporting the climber. On the tree climbing course you shouldn’t suspend yourself from branches less than 4” in diameter. Do I wear spikes when climbing trees? There is no requirement to use spikes during climbing unless the tree is being dismantled or there is a need to carry out a rescue. If you wear spikes on a tree when not needed, you are introducing diseases and weakness into the tree. If it was a lime tree wherever you put your spike a shoot would emerge in time and cause future problems for the tree. SRT is Single Rope Techniques, this is a method of accessing and working a tree using mechanical aids to climb. It can make climbing a lot easier but requires a good understanding of rope systems and equipment. Is there anything I could read in preparation for the tree climbing course? Do I need to get my equipment inspected? Personal tree climbing equipment is supposed to comply with the Lifting Equipment and Lifting Operations 1998 and should be inspected on a 6-monthly basis by an independent person. This period cannot be extended but may be shortened due to the working environment or specific requirements of the site you are working on. Can it be too windy to climb? That is up to you and your confidence levels. If there is a problem, you will have to explain to the insurance company why you were up a tree on a particularly windy day with a chainsaw. Do I need to know different tree species? It is advisable for your personal growth to learn more about trees and their characteristics, especially with the number of pests and diseases that are about these days and we need to improve our bio security in general. Can I use my forestry helmet with a chin strap? If you are working on the ground there is no problem using a forestry helmet with a chin strap but in the air it is not allowed, you must wear a climbing helmet. How do I choose a climbing rope? Ropes are like harnesses; choice is down to personal feel. The average rope is 10mm to 13mm diameter although 12mm to 13mm is more commonly used as they are easier to grip and less chance of hand strain. The smaller diameter ropes are used mainly with mechanical aids and, depending on the item you use, as a friction component. The manufacturer may state a rope diameter, which you should follow for your own safety. Can I climb in the rain? Yes, there is no reason why not. The tree may be a bit more slippery and you may have to adapt the climb to the conditions but there is no reason why you can’t. Listed in the Arboricultural Associations Guide to Climbing Practice is the equipment required. The number of pieces is down to you and your budget. Be careful as it is easy to buy too much and buy lots of shiny bling that you may never use. If you attend a course with Lowe Maintenance, you will know what to buy by the end of the course as you’ll have used the kit during the course. How high do I have to climb? It depends on the tree and the distance between the branches, there is no easy answer, ideally you need to get as high as you can so that you can carry out effective branch walking. Do I need a first aid qualification for rescue? It is highly recommended that anyone working with a chainsaw should have some level of first aid training due to the increased potential for an accident. How often should I practise aerial rescue? It is advised by HSE that you practise at least once a month. If you require an aerial rescue refresher give us a call to arrange a suitable date. Can I do CS38 and CS39 together? You can do them both together but if you fail the CS38 assessment you cannot take the CS39, so it can get rather expensive. It is far less stressful for the candidate to do them as individual units and that way they get plenty of practice it is also less stressful. Do I need to do refreshers? You are advised by HSE to have a refresher every 5 years, this however depends on the company you work for, as some have different regulations for refreshers such as National Trust which is every 3 years. Do I have to do the full five days? If you have never been in the air before it is advisable to take the full course and allow yourself plenty of time to get as much practice as possible, ready for the assessment. However, there are no guaranteed passes. If you have been climbing for a while, then the course can be modified to meet your needs and possibly completed over fewer days of training. Do I need to bring a chainsaw? We tend to provide the chainsaws as you might not know what to buy until you have done the course. You wouldn’t want to spend hundreds of pounds buying a machine and finding it was the wrong one or one you didn’t like. Is there a preferred chainsaw brand for the CS39? No if it cuts wood it will be fine, there is no best chainsaw it is down to personal preference and budget. Can I use a top handled saw one handed? Can I do the CS39 straight after the tree climbing and rescue course? Yes, if you have passed the assessment for the CS38 but you may find that getting into a good cutting position a bit harder because you will be tired and have not had enough practice getting into position. The additional weight of the chainsaw can throw you out. Can I use my own kit for the CS39? Yes, if it is in good condition and has relevant LOLER documentation with it. Is there any rigging involved in the CS39? No, it is only a free fall course so use of ropes is not required. Is the CS39 a pruning course? Not really but you do have to finish off the limbs with proper pruning cuts and observe the branch bark collar. The qualification itself doesn’t cover pruning in detail, that is covered under Aerial Tree Pruning 21-07 (formally CS40). Do I have to do the full two days? If you have climbed before and feel confident then no, you don’t have to. However, this is done entirely at your own risk. If you fail the assessment due to lack of training time, then that is your responsibility and we accept no liability for it. Will I be using spikes on the CS39? How long does my ticket last? The City and Guilds qualifications last for life however it is always good to check on a regular basis to see if there have been any major changes that you should be aware of. You are advised by HSE to carry out refreshers every 5 years. This could be different depending on the company you work for, some have different frequencies such as the National Trust, which is every 3 years. Refreshers are important as they keep you up to date with changes within the industry. What tickets do I need to attend the CS39? Will I need to show my ticket to buy a top handled chainsaw? There are some suppliers that will ask to see it but there are far more that will not check and just sell you the chainsaw. What does free fall mean? If you cut a branch and let it fall to the ground without limiting its descent by use of lowering rope. What cuts will I do on the course? Is there a maximum size to cut off for the CS39? Will target pruning be covered on the CS39? Why do we need to prune trees? Pruning is a way of removing branches that are causing harm or damage to the tree. It’s a way of reducing weight in the tree without encouraging heavy re growth. The type of tree decides the severity of the pruning you can do and how much you can do at any one time. Why can’t you just chop if off? Does a proper pruning cut matter? Yes, a proper pruning cut can allow the tree to self-protect but if you have hacked a branch of and left a large wound then it will encourage pests and diseases to enter and damage the tree in the long term. Will I be using a chainsaw on the course? The main cutting tools used are loppers, secateurs and handsaws but sometimes a chainsaw is used to deal with bigger limbs. What’s the difference between CS39 and CS40? CS40 is for when you can easily get to points of the tree that are in need of thinning out and the wounds are better put in with a thin blade than trying to cut a little twig with a chainsaw. Do I really need the CS40? Depending on the work you are doing not always. It is being used a lot more by railway and utility companies, as they have realised that a properly pruned tree lasts longer and is easier to manage than a tree that has been sided off with therefore a greater risk of failure. Can I do the CS40 and CS41 at the same time? You can but it will be a lot to take in and the assessment fee may be a bit more as the assessor can only do a certain number of tests in one day. We would recommend doing them separately so that you learn everything required in a reasonable timeframe and you are not putting excessive pressure on yourself. What’s the difference between, crown thinning, crown reduction and crown lifting? Crown thinning removes all the crossing limbs and thin out the canopy of the tree to let air through and limit the weight of the tree while keeping the shape of the tree. Crown reduction reduces the overall canopy to a manageable size and staying within the percentages required to keep the tree healthy. A crown lift removes the lower limbs of the tree to allow movement around the base of the tree, this does not have to be a large limb just taking off some side branches will allow the main branch to lift. Do I need someone on the ground for lowering? There is no lowering involved in this unit but it’s best to have someone on the ground in case you have a hand saw strike. Is rope work and rigging involved? No rope work or rigging is covered in aerial tree pruning, that is covered in aerial tree rigging 21-09 (formally CS41). Can I go straight from CS39 to CS40? Yes, the pre-requisite for aerial tree pruning 21-07 (CS40) is to have aerial cutting of trees with a chainsaw using free fall techniques 21-08 (formally CS39) therefore if you have passed CS39 you can do CS40. As they cover different topics it’s quite a straightforward next step. Why do I need CS41? CS41 is the use of rope systems to dismantle a tree. There are plenty of occasions when a job will entail a dismantle rather than a straight fell. Sheds, conservatories and houses all need different considerations when completing tree work. Does it have to be a lowering rope; can’t I use my climbing rope? The lowering rope must be separate from the climbing system and be fit for purpose. The LOLER regulations define the difference between lowering and climbing ropes you are not allowed to lower on a rope one day and climb on it the next. What tickets do I need to attend the CS41? Do I need my CS40 to do CS41? No, to complete aerial tree rigging 21-09 (CS41) you don’t need aerial tree pruning (CS40) as a pre-requisite. Does my rigging kit need a LOLER inspection? Yes, all rigging kits must be LOLER inspected every 12 months unless stated otherwise, however this period can be shortened in certain cases. Can I use my own kit and equipment on the course? Yes, if it is fit for use and you have the current LOLER records with you. If you wish to discuss this in more detail give us a call 01729825132. Do I need a groundie? Does everyone in my team need the CS41 ticket? How big will the trees be? It depends on the course, some of them may have a bit of size to them as this gives plenty of time to rig and lower sections and plenty of branches and wood to train with. The aerial tree rigging course with Lowe Maintenance prefers to place you in trees with some significant height. This ticket is one of the last you’ll do within the climbing units and for you to feel 100% confident once you’ve passed your assessment, we feel that the trees should be tall. Once you have the ticket and go back to work the next day you could be put in front of any size of tree, you need to know you could handle that situation. Do I need to use spikes? Yes, for this course you will be in spikes all the time as you will have cut off the limbs you would have used for balance. Ideally you need to have had some practice with spikes before attending the aerial tree rigging course. Do I have to use a steel core flip line? For the dismantling of the pole section it is the preferred industry standard but you can also use a soft strop, however, you must be backed up with your climbing rope in case the saw hits the soft strop and cuts through it. Will my rope be long enough? It depends on the height of the tree, you may have to change over on the way down so you should be able to complete this change over with ease in trees, before attending the course. Can I use my climbing karabiners for lowering? No lowering kit cannot cross over into climbing kit; they should be kept separate at all times. Is there anything I can read in preparation for the course? The Art and Science of Practical Rigging is a very good book to look at, there are plenty of other books and also some very good descriptions on YouTube but watch out for the rubbish on there too! Can I dismantle dead trees? We are not allowed to let you train on dead trees but in your professional life it is your call to assess the condition of the tree before you carry out the work. If in doubt seek advice or have a tree survey carried out. There is fungus growing in the tree, can I still work on it? Can I use out of date climbing ropes for lowering? You can use an out of date climbing rope but it cannot be used to hold the same load and it must be in good condition and marked up as a lowering rope so that it does not creep back into a climbing bag by mistake. Most people use them as tug lines or lashing lines for trailers something quite different to avoid confusion. Can I go straight from CS39 to CS41? Yes but it will be a steep learning curve. If you have not climbed very much and are trying to do a fast track method, it’s always best to have a bit of time between courses to build up your knowledge and confidence level. What tickets do I need to fell over 380mm (CS32)? What size of trees can I cut? The certificate is for 380mm and above so potentially you can cut monsters after the course but it takes time to build up the knowledge to cut very big trees. A tree is not measured at ground level but at chest height so a tree 380mm at chest height could be a nice bit of wood to deal with. The reason we measure at chest height is because the base flairs and looks a lot wider then it really is. How big a chainsaw do I need? The minimum guide bar size for the course is 18inch this will give you plenty of bar length to achieve the type of cuts we will use. It will make it much easier to cross cut the stem and deal with anything else that crops up. Why do you need a winch for felling trees over 380mm? The size of trees makes it harder to twist out a tree using a felling bar so winches are used in the hung-up part of the course. We provide the winch for the course so you know it will be the right size and type needed. What winch size do I need? If you wish to bring a winch with you on our course, you will need one with a straight line pull of 1600kg. However, we do provide them for the courses so if you haven’t bought one already, we recommended waiting until you have done the course so you have a better idea of what is available and what you like and don’t like. Does size and strength matter? The strongest muscle you have is the one between your ears (brain). If you can think through the problem, then these days, with the equipment to hand, you don’t need to be built like a brick privy. The more tree work you do then physically you will start to develop. Can I do over 380mm straight after under 380mm? Yes, you can but we advise people to go out and hone your up to 380mm skills before you go for above 380mm. There has to be a gap so you can get used to working with the saw and moving timber, then when you feel it is right you can go for the above 380mm. Is there a large trees ticket now? Yes, there is but there aren’t many large trees in the country. The 380mm and above will cover you for most trees but if your knowledge has grown to the level where you are felling much bigger trees it may be worth taking on the large tree ticket. How tall are the trees that we’ll be felling? There is no set height, it is down to diameter at chest not how tall. A plantation grown tree can be very tall and thin whereas an open grown tree can be very broad and short each tree is different. Do I need to stack the timber? The size of the timber you will be dealing with will make it very hard to stack as it will be cut to product lengths and the manual handling regulations will not let you break yourself just for a course. What you do in your own working environment is up to you but best practice is to use a mechanical means to stack the timber. Will I have to stack the brash? Yes, it’s good practice to tidy the brash into designated rows or piles and keep the forest floor as easy to move around as possible. This is all part of having a good reputation too, if you leave sites a mess you could be limiting future work. What’s the difference between the emergency tree work and windblown ticket? Windblow is mainly for forestry operations where there is machinery to remove severed trees and the requirement is for the cutter to just sever the root plate and step back for the machines. CS50 is for the arb company that attends the individual tree that has blown over in a park and exposed gas pipes and electrics and a whole lot of other problems so you are not only dealing with the tree but also all of the services required to get the job done. What tickets do I need for emergency tree work (CS50)? What’s the recommended bar length? The recommended chainsaw bar length for completing the emergency treework operations course is 18 inch, a size that can be handled quite easily but still allow you to get the work done. What kit and equipment do I need to bring? If you are attending a Lowe Maintenance course and you bring your normal cutting equipment and PPE, all the rest of the equipment will be provided by us. Then by the end of the course you will have a good idea of what to go out and buy. What’s the best sort of winch? A hand winch is best as it takes in cable slowly and stops the chance of rapid failure, whereas a powered winch can sometimes be more hassle than it is worth. Does my winching kit come under LOLER? Your winch and its parts come under PUWER (Provision of Work Equipment Regulations) and this states that the winch must be inspected yearly by a competent person. What kit do I need when I’ve passed? That’s not easy to answer, a lot of it is down to your preference. By doing a course with Lowe Maintenance you will have the opportunity to try out different bits of kit and then make an informed decision as to what to buy when you go back to work. What is an emergency tree situation? An emergency tree situation is where a tree has failed due to weather or disease and has become unstable in its present position and condition. This could be in a public park, on a roadside, near to houses, car parks and places where you tend to find the public and lots of utility services running in the ground. Why do I need the emergency tree work (CS50)? Most councils will not let you attend an emergency tree situation if you do not have the proper qualifications to deal with it, the risks to yourself and others is too great. Your insurance company may also want you to be properly qualified to handle these situations. Will emergency tree work (CS50) be suitable for Forestry Commission sites? You may have to ask the site manager but it depends if you are also working around large machinery at the same time, you may find that you need individual and multiple windblow instead. Can I deal with emergency trees on my own? No, industry best practice is that you never cut alone. When is the best time to deal with an emergency tree? When the weather has settled down and there is only the risk from the tree and not everything thing else. Do I need my wind blow ticket? 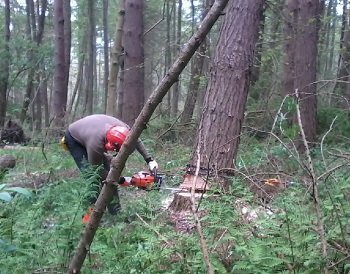 Yes, if working in forestry situations there are set ways to approach a tree that has blown over or has been subject to violent forces, it’s not just a matter of hacking away with a chainsaw until it’s down. There are also the insurance companies that want to know if you have had a form of training otherwise they may not cover you. Forestry Commission sites and managed Tilhill sites may also insist that you have the relevant windblow ticket too. A tree that has been blown over and is lying flat is the basic windblown picture. There are stresses in lots of directions, from the root plate that is now in the air and the tree that is laying on its side. If a tree is part blown the root plate has broken but the tree is laying against another nearby that is also windblow. If you have a top blown out of one tree and it has stuck in another that too is windblow, you have two problems to sort in this scenario; the pole that is left and getting the broken top sorted. So, if you have a tree that has been subjected to forces that has damaged it in a way that has left it unsafe it’s windblow. It’s a basic term used to describe problem trees after a storm. What tickets do I need before I do the windblow course? What’s the difference between individual and multiple windblow trees? Individual is one tree with room around it to work, you could have a forest with quite a bit of spacing around each damaged tree. Multiple is when you have a line of trees all blown together in all shapes and sizes, with stresses and strains in all directions. It’s a bit like defusing a bomb with a chainsaw if you just hack away at it, something will get you. Why can I now do individual and multiple windblow in the same course? The unit has been re written and considers that most forestry sites have large plant machinery. So your task, as a cutter, is not as labour intensive; you will be using a winch to secure the root plate but then a machine will process the cut tree. Your task is now to work alongside the machinery cutting trees the machines cannot get. Do I need a first aid ticket to do the wind blow course? Yes, as with all of the cutting units there is a potential for injury. There is a greater potential for injury when dealing with windblown or damaged trees. Winches, what’s the best one? On the courses we use hand winches, my preference is a tirfor winch but there are so many about these days and it’s really down to your budget. The minimum straight draw for the course is 1600kg so that is the size of winch you start looking at purchasing. We do however provide winches and chat about the different types available on our courses. Can I deal with wind blow on my own? It’s not good practice to work on windblow sites on your own, if there is a problem your insurance will be void unless you have cleared it with them first. The risk is too great, common sense should kick in really. When is the best time to deal with windblow? When all has calmed down, the sooner the better really. Don’t waste the timber, the longer it is down the harder it is to reset the root plate. Do I need to process the trees after cutting? The course is all about safety but you are also advised to get as much usable wood from the site. Extraction is normally carried out as soon as we leave. You won’t be wasting wood but you can’t always process a tree in a tight parcel of windblow it’s up to the harvester or forwarder to extract the tree to a process-able position. Do I really need a groundie ticket? The groundie ticket is there to help grounds’ staff aid a climber without asking for too much direction, it leaves the climber to get on with job. It’s a very good way of learning about the use of the kit and being able to do your job more effectively. Do I need to be able to climb trees for a groundie ticket? No, it is not a requirement to be able to rescue even though it would be of use on the site and possible aid promotion. Do I need a chainsaw ticket to do CS45? You will need chainsaw maintenance and cross cutting 20-03 (formally CS30) or equivalent. What PPE should I have? Standard felling PPE will be fine, it’s always best to use leather gloves to handle the ropes but otherwise your basic felling PPE will be fine. Do I need to be strong? No, the lowering system is designed to take the strain so no undue strength is required to be a groundie, although the more you do the stronger you will become. Would some sort of communication system help? There are radio systems available but not a requirement. They do make the job easier, in that you’re not having to shout up the tree over lots of noise on the ground. A good communication system saves a lot of stress and agro. Why do I need a brushcutter ticket? Under PUWER regulations anyone using machinery within their work must have received adequate training whether it be formal or informal and meets the requirements of their insurance company. What does the brushcutter ticket cover? The City and Guilds ticket only covers the use of a brushcutter and/or trimmer, to include pre use checks, maintenance and safe use. Can I use a clearing saw blade? Not with the brushcutter and trimmer course, the clearing saw has its own qualification which you’d need to take if required. What PPE should I be wearing? Why use a plastic full-face visor for trimmer cord? It is important that you use the correct PPE when switching from brushcutter to trimmer. The trimmer head requires you to wear the plastic full-face visor NOT the metal mesh visor. The full-face plastic visor gives you the required level of protection from resins and saps from the plants you are trimming. Can the course be done in a day? With Lowe Maintenance the City and Guilds safe use of brushcutter and trimmer course can be completed in the one day, as we run the integrated training and assessment option. It is possible to have the training and independent assessment, you’d need to specifically ask for the option though when booking. What’s the minimum working distance? The minimum safe working distance when using a brushcutter or trimmer is 15m. Do I have to do the full course? No, you can choose to do just the brushcutter or trimmer training with no assessment process. If your insurance company are happy with this, it does reduce the cost. Please get in touch for more details. Are there specialist brushcutter trousers for extra protection? Yes, there is a range of brushcutter trousers that are available for extra protection. Sthil, Oregon and Husqvarna brands are available. There is a jacket option available too. Why do I need a ticket for hedge cutter? Handheld hedge cutters can be a dangerous piece of equipment, you are more likely to cut yourself with one than a chainsaw because they take time to cycle down and the scissor action of the blades. What machines does it apply to? Any machine you use in the workplace for cutting hedges, one sided, double sided, battery, electric, petrol, long reach, combi heads. Do I need to know species of hedges? Not for the course, as you’ll learn more about hedging species, timings and frequency on the course. However, you will do a better job in the work place if you can identify species and carry out work at the right time thus not damaging or killing the hedge by mistake. What PPE should I be wearing when using a hedge cutter? No, you can choose to do just the handheld hedge cutter training with no assessment process. If your insurance company are happy with this, it does reduce the cost. Please get in touch for more details. Is it possible to sharpen hedge cutter blades myself? Yes, this is covered on the course and you’ll have the opportunity to have a go. Why do I need a ticket? What machines does it cover? Whether it be battery, electric or petrol, if you use one in the workplace you should have had some training. A number of reasons have found it necessary to have a leaf blower course, these include, with the machine being used more and more in the workplace and having a engine with the possibility of a lot of power the decision was taken to produce a formal qualification. The other being misused and horseplay on the work site, such as the leaf blower challenge (putting the hose in near to your mouth and running the machine at full power to see how long people can last – videoed and then put on social media). Who needs a leaf blower ticket? Usually as integrated training and assessment it can be completed in half a day. Can it be completed in the same day? Yes, through integrated training and assessment. How many people can be trained in a session? 4 four per session can be training and assessed. What options do I have? You can either complete the City & Guilds training and assessment or choose to do just formal training with no assessment, provided your insurance company are happy with that arrangement. What could I use a leaf blower for? Most commonly used for blowing leaves, chip and arisings at the end of the days work. Also, for clearing newly fallen snow and more recently controlling of the flames during heather burning season and wild fires. Why do I need a ticket for ATV’s? ATV’s are sometimes seen as a bit of fun and not fully respected, at the end of the day it is a machine designed to do a job and if mis-used the consequences can be fatal. Fatalities are becoming more frequent due to people not understanding the machine and its capabilities. Under Health and Safety at Work Act 1974 you are required to wear appropriate PPE in the workplace. A helmet therefore should be worn. If not driving for work related matters on the road by law, you don’t have to wear a helmet as it is meant to be safer as all wheels are in contact with the road surface. Common sense would hopefully kick in, these machines are not toys and as such you should ensure you are wearing a helmet at all times and if you are able to take passengers they too should be wearing a helmet. Will I be driving with a trailer? If you choose to do the trailer unit too, then yes. Ideally try and get some practice in reversing the trailer before attending the course and assessment. If you don’t require the trailer unit, please let us know on booking as we automatically put you down for it at the same time. Do I need a driving license? If you are driving on the road, then yes you will need a driving licence. Is there one ticket for all machines? No, it is dependent on which machine you will be driving. ATV sit astride, ATV sit in, Argo cat is a separate one again. Can training and assessment be carried out in the same day? ATV sit astride, not at the moment. It is classed as a more dangerous machine, so it can only be done through an independent assessment with City and Guilds. However this is looking to change in the near future so please do ask to see if integrated is available. ATV sit in, yes this can be completed in the same day through integrated training and assessment. How old do you have to be to drive an ATV? Legally you must be over 13 years old. However, manufacturers may state that you have to be 16 years old if this is the case that is the age that someone can drive that particular model. Can we do the course at my work place? Yes, if the machine is in safe working order and you have the terrain to enable the course to be completed on. Please get in touch to discuss the suitability of your machine and site. No, you can choose to do just the ATV training with no assessment process. If your insurance company are happy with this, it does reduce the cost. Please get in touch for more details. What terrain will the course cover? As part of the course you will be expected to drive up, down and along slopes. Will I have to reverse the trailer? If you have chosen to do the trailer unit, then yes. You need to be able to reverse around a 90-degree angle. We would advise getting some practice in beforehand if you haven’t done much before. What maintenance is carried out on the course? General pre-use checks to ensure suitability to drive, such as fuel, oil, water, electrics, tyres, air filter etc. Anything above and beyond would be carried out when you send the machines for servicing. Do I have to know about engines in detail to attend? No, you will learn during the course what is needed and what is expected of you under Health and Safety and PUWER legislation. Why do I need a wood chipper course? To learn about the basic maintenance and if anything goes wrong to direct emergency services as to what comes off on the machine, so amputation is a very last resort. There have been occasions where people have lost arms or legs due to untrained staff using the machine, you don’t want this do be you. What is a wood chipper? There are lots of different machines but they mainly take the brash or waste wood and turn it into fine chips that can be more useful and far easier to transport than the branches. Can I put wood chip straight onto the garden? No, it is not good practice. As the chip rots it takes nitrogen out of the ground to help the decomposition process, the removal of this nitrogen puts the plants, trees and flowers under stress and can potentially kill them off. It is best to leave the chip for at least 6 months (turning regularly) before using it as a mulch. The chip, if clean, is very good as a base in chicken pens, mine used to love it! Do I need to bring my own wood chipper? It’s always best to try and use your own but it’s not necessary, Lowe Maintenance can provide a chipper for the training and assessment. What type of wood chipper is the course for? The course is for self-feed chippers that’s a chipper that has feed rollers and safety system to match. Can you come to our work place to do the wood chipper course? Yes, provided you have plenty of brash and somewhere we can get out of the weather to do the maintenance. We have used a tarp strung between a few trees before; after all, you won’t be using it indoors! What PPE do I need for the wood chipper course? Ear plugs in addition to ear defenders, in case your ear defenders are not chipper specification. What type of ear protection can I use? You can use ear defenders but if they are not rated for the chipper you could buy a helmet with chipper specification protection. You can also wear earplugs under your ear defenders as an extra level of protection. No, it’s the type of feed system that is important. Is it just basic maintenance on the course? Yes, just the basics otherwise you would get a worker on a site taking a chipper apart when it only needs fuel. How much chipping do we need to do on the course? You must demonstrate you can offer wood up to the feed rollers properly and safely and also demonstrate the use a push stick if the feed rollers cannot grab a piece of log properly. It is easier to use a helmet you can use eye protection and good ear defenders but sometimes logs flail or the chipper spits bits back out of the hopper, which could get quite painful. It also depends on the length of the wood you are chipping sometimes long lengths can flail about in the infeed chute. It is best practice therefore to use a helmet. Why do I need a utility pole ticket? It’s not easy to see which way the pole is weighted and it may be rotten at the bottom that isn’t clearly visible. What tickets do I need before I do the utility pole course? Who is the utility pole course for? Utility supply companies, the power industries. What’s the difference between utility poles and felling trees up to 380mm? It is fairly easy to tell the lay of a tree whereas utility poles are a very old bit of treated wood stuck in the ground and put under heavy forces by cables and the like, so it’s not always easy to read and the wood is not as fibrous it is mainly very dry, so the hinges are not very good when it comes to the felling. What size/diameter are the poles? The poles fit within the 380mm size, but you still have to have the utility ticket to sell them. If you are working on land that you own and have checked with your insurance, you may not need a ticket. However, if you work for someone else and are working in the public domain then a grinder ticket is required to keep the insurance company happy. Also, for your own professional development, each machine has its own little quirks and if someone is paying you to remove a stump as a professional it’s better to know exactly what you are doing. What is a stump grinder used for? A stump grinder is used to extract as much of the below surface tree stump as possible to be able to clear the area ready for re planting or grassing over. What different stump grinders are there? There are lots of different stump grinders from PTO driven to self-propelled, they are all designed to do the same job, it’s down to the size of tree and access to the site that affects the machine you would use. Can I use our small pedestrian machine for the course? Yes, if it has all the safety markers and is fit for use, then there is no reason why not. How much maintenance is involved? As with all the machinery-based tickets available, there is a certain amount of maintenance that needs to be covered to gain the qualification. You aren’t expected to strip the whole machine down on the course but you are to go through the key features and discuss differences between machines you will come across in the job. The maintenance does require you to change the teeth and service the power plant as normal so the first part of the day will be cover the maintenance of the machine. Do I need to use a CAT scanner? It is highly advisable to have scanned the ground and looked at service drawings on the area you are going to grind. Stump grinders are brilliant at finding every cable, pipe and wire that you don’t want them to, which can prove costly for you. Why do I need a pole pruner ticket? The machine has the potential to cause an accident not to yourself but others because the chainsaw is so far from you it’s not always possible to control it easily. I’ve already got my chainsaw ticket; do I have to do pole pruner too? Yes, because you have your chainsaw ticket you can bypass some of the maintenance but you will still have to work on the power unit and the use of the saw and pay close attention to detail on the pruning cuts. Is it easy to use a pole pruner? It can be a bit awkward getting used to doing a pruning cut from so far away but with practice you can do it, you just need to take your time and get as much practice as possible. It is not just about chopping it off, you need to take care and focus on caring for the tree long term. How accurate do I have to be with a pole pruner? You should be able to prune properly and not tear cuts. You shouldn’t over cut and therefore damage the branch collar bark, equally you shouldn’t leave stubs. In preparation we recommend you look at target pruning methods. Can I use a pole pruner from a MEWP? No, it’s not recommended to use a pole pruner from a MEWP (mobile elevated work platform) because it can throw out the balance of the basket. Also, if you lose control of the pole saw it will fall from height potentially injuring someone but also damaging the machine. Leaving the EU, do I need to do these tickets now? Yes, because it’s a UK safety standard not an EU safety standard. Also, the UK has some of the highest safety statistics and other countries tend to follow what the UK puts in place. What’s the minimum age to do City & Guilds / NPTC tickets? Why do City & Guilds rather than Lantra? City and Guilds has an extremely long history of being an Awarding Organisation and known throughout all industry sectors as one of the main bodies to be certificated through. Lantra is known more for being a sector skills council that has moved over to being an Awarding organisation. Lantra qualifications tend to be done by those in Scotland and Wales as they are seen to be the cheaper alternative. Many companies will not accept Lantra certificates and insist on City and Guilds. City and Guilds qualifications have a higher standing and are recognised in other countries and can assist people in gaining work visas. How long do my City and Guilds tickets last? Once achieved they last a lifetime. Can I use my Lantra tickets as pre-requisites? If you gained your certificates after 2015 then they can be used as pre-requisites for City and Guilds courses, if you have any doubts get in touch and we can investigate your options for you. I have a blue book; how does this affect me? The blue book was the original method of certification for NPTC qualifications, the tickets that you gained in the book may be listed on the City and Guilds system so can be matched if needed to the new qualifications. This is worth double checking just to be sure. Difficulties can occur if you need to evidence the blue book as the codes and titles have changed so they can take some figuring out as to what you have, it is not straightforward enough for employers or contracts. Also, as so many things have changed over the years it is quite important that you have been refreshed in the original tickets or done some other tickets more recently. Why do I need a ticket for rat poison? The law changed in 2015, stating that only professional users of rodenticides can buy poisons and certain pack sizes, for controlling rats and mice. This affects a wide range if interests including: farming, smallholding, allotment holding, equine establishments, horticulture (including grounds maintenance and amenities), industry, railways and sewers etc. What is meant by professional user? A professional user is anyone who applies a professional product no matter the amount or method used. This includes operators, employees, technicians and self-employed people. Basically, if you are earning from the application, whether that be directly or indirectly (such as farming), you are classed as a professional. What ticket options do I have? There are a few different options available to people wishing to gain a certificate of competence for safe use of pesticide for vertebrate pest control for rats and mice. With Lowe Maintenance you have the choice of a face to face course or an online training method, both options have a practical assessment that must be achieved to gain City and Guilds certification. Can I apply poison for other people once I’ve got my ticket? The City and Guilds Safe Use of Vertebrate for Pest Control for Rats and Mice, the qualification enables you to apply rodenticides in any sector (agriculture, horticulture, game keeping, industrial); there are no restrictions to the industries to work in. The only restrictions are those on the labels, which you must adhere to. Can’t I just buy smaller packs? There is nothing to stop you buying rodenticides in smaller quantities other than that is it far more expensive in the long term and that if you are auditable, under farm assurance programmes etc, it may not fit with their criteria, so it would be a good idea to check what you can and can’t do. To reduce secondary poisoning in non-target species as many anticoagulants, used by people controlling rodents, have a half-life. The HSE need us to use rodenticides with greater care to protect both people, non-target species and the environment. The face to face course is one day training, with a couple of hours on a second day for the practical assessment. Will the course be an accepted option under Farm Assurance programmes? Currently if you are registered with one of the 11 farm assurance programmes there is no requirement to complete the training, however this is likely to change in the future. CRRU is the Campaign for Responsible Rodenticide Use and they have produced a code of practice which is more about changing emphasis than it is about changing practice and the concept of the ‘risk hierarchy’ needs to be at the forefront when deciding a control strategy for any site. Can I just go back to traditional methods, like trapping? Yes, you can go back to traditional control methods such as trapping, shooting, dogs or cats. In fact, this is actively encouraged as part of the ‘risk hierarchy’ and should be considered before using rodenticides. Half life is the amount of time it takes for a substance to reduce its concentration by half, in most first-generation anticoagulants it is hours to days, whereas second-generation anticoagulants can be days to months. The problem being when the rodent is then eaten by a predator and secondary poisoning can occur. What’s the difference between 1st and 2nd generation poisons? First generation anticoagulants are less acutely toxic and less persistent in animal tissues than second generation anticoagulants. It may be assumed that they present a lower risk of both primary and secondary poisoning for non-target animals in most situations. Second generation anticoagulants are acutely toxic and have long biological half-lives. So, present the greatest risk to non-target animals and the environment. Permanent baiting shouldn’t really be used as general practice, the problem is that it is increasingly recognised that small, wild rodents, such as field mice and voles, also go into permanent bait stations and take bait. These animals are the prey base of a very wide variety of species of mammals and birds in the UK. This prey base is then exposed to rodenticides and this contamination is passed to our wildlife up the food chain. Rat problem? Can I just tidy up? Yes, that would be a great start in sorting out your rodent infestation. Rats do not like changes and open spaces. So, by tidying up, getting rid of rubbish, debris and old equipment along with clearing vegetation around buildings so that natural predators can take the rodents would help tremendously. I’m Farm Assured, do I need a rat poison ticket? Currently as long as you’re within a Farm Assurance programme and you’ve completed the Point of Sale Declaration – Farm Assurance Scheme document and given that to your supplier you can continue to buy rodenticides without a ticket. I only have a small holding; do I have to get a ticket? If you wish to continue buying professionally labelled products in larger pack sizes, then yes you will need to gain a recognised qualification. How do I keep up to date? Join Lowe Maintenance’s newsletter key points of information as they become available are shared or you could regularly check the www.thinkwildlife.org.uk website where CRRU make information available. What records do I need to keep? There are several ways the regulations are policed, the CRRU www.thinkwildlife.org.uk has a reporting system on their website where any concerns of mis-selling, mis-use, and mis-application can be reported. The Wildlife Incident Investigation Scheme (WIIS) will investigate any suspected poisonings of non-target species found. HSE has overall jurisdiction and will investigate suppliers and users. What happens if I get caught? If you are found to be applying rodenticides without the required certification and you are reported HSE will investigate. Cases have been investigated to date and to stop this irresponsible behaviour, it is currently being discussed whether or not these cases will be made public to deter other offenders. Aluminium phosphide is an extremely toxic product and the phosphine gas released is lethal. It is derived from the mustard gas used in WW1, it is designed to kill thus a great deal of respect is required when using the product. What can be controlled with aluminium phosphides? Safe use of aluminium phosphides for vertebrate pest control is for the control of rabbits, rats and moles only. It can’t be legally used on any other species. How dangerous is aluminium phosphides? It is extremely dangerous and if mis-used has the potential to kill any living creature. There are only two products available Phostoxin and Talunex and these can only be bought if you have a ticket. Do I need a ticket to use Phostoxin and Talunex? Yes, in order to buy Phostoxin of Talunex the end user must have a relevant ticket which classes them as a professional user. Where can I use aluminium phosphides? In the runs, tunnels and burrowing systems of rats, rabbits and moles. You can’t use the products within 10m of a building or water course. Can I use a few and put the rest back in storage? No, this is not safe to do. As soon as the container is opened the gas becomes liberated and continues to do so until the tablets have dissolved. By putting the lid back on you are increasing the risk of contamination for yourself and others but also of the container sparking and igniting. You should use all the tablets in the container in one application. Why do they smell of garlic? As phosphine gas has no smell, the tablets have been injected with the smell of garlic to act as a warning sign. If you can smell garlic leave the area immediately and don RPE and PPE to investigate further. What type of respirator should I wear? A full-face respirator with relevant cartridges P3 for particulates and B2 for gas. A face fit test should have been carried out, and if you have facial hair and glasses you may need to use an approved powered hood system. Will a dust mask do? No, this offers you no protection. It must be a full-face respirator with relevant cartridges, the full-face element is really important the half-face option will not protect your eyes from the gas that could blind you. Why do I need to use an applicator? The applicator is an engineering control, designed to keep the product as far away from you as possible during the application. Once achieved, your City and Guilds ticket will last a lifetime. Should I do aluminium phosphides refreshers? The HSE advise that refreshers are taken every 5 years, it is entirely up to you. However, things do change, and this would ensure you are up to date with current practices, latest up date is to do with monitoring gas levels and exposure and the equipment to do this. Can’t I just use traditional methods of control? Yes, many people have decided to not get the ticket and go back to traditional methods of shooting, lamping, trapping, dogs, cats etc. In 2015 the law changed, anyone who uses pesticides as a professional must have certificates of competence for the application method they are using. I’ve got grandfather rights, haven’t I? There is no such thing as grandfather rights to apply pesticides. There is a grandfather right version of the qualification, if you were born before 1964 you could choose to do this qualification. It only enables you to apply pesticides on your land though, nowhere else. This grandfather rights qualification will cease to be available in December 2018. Can’t I just do the PA1 foundation unit? The PA1 foundation unit does not allow you to apply the pesticides and this is clearly stated on the certificate you receive. In order to legally apply the pesticides, you need the relevant application units. Can I buy products from the internet? There is no law stopping you buying a pesticide product, you may be asked at the point of sale for evidence of your certificate. You can stock pile as much as you like, but you break the law when you apply the products without certification. Isn’t there just one ticket that covers everything? Unfortunately, not, because there are so many ways to apply different products it is not possible to just have one ticket to cover everything. There are over 50 different application methods available now and you must choose which ones you need, to continue with your work. What’s the difference between PA6a and PA6aw? PA6a is application of a pesticide on land up to 1m from the top of a bank or water body. PA6aw is application to or near water. Both are quite different in where you can apply pesticide and one does not allow you to do the other. Do I need permission to apply pesticides near water with hand held applicators? To apply pesticides near water you will need Environment Agency approval, an Aquaherb01 will need to be completed and permissions given. However, to complete the form you need to ensure that the product has aquatic approval and you have the correct application methods for the work you are planning to do. I did my tickets in the 1980’s do they still stand? If you did the City and Guilds tickets and you still have your certificates, then yes, they still stand. If you did the Agricultural Training Board (ATB) route and you didn’t up grade them to City and Guilds when requested, then unfortunately it is unlikely that you still have the qualification. How can I check if I have my spraying tickets? If you think you did your tickets and have lost them, we can check with our assessment centre to see if you’re on the system. Please email us with your name, date of birth and address of the place you lived and when you did the courses. Do I need to do refreshers for pesticides? HSE advise that refreshers are taken every 5 years, however that is entirely up to you. It is recommended because things have changed quite a lot in the last thirty years and if you had an incident one of the first questions you are likely to be asked is when were you last refreshed? I don’t use pesticides, only weed killers do I have to do the ticket? Do I need to bring my own spraying equipment? No, we can provide all the spraying equipment at no extra cost. That way we know all the equipment isn’t contaminated in case someone has a reaction to a product that was used if you bought your own kit. I’m no good at maths, will that be a problem? My maths is shocking, and I can do the calibrations. You are able to use a calculator and the calibration sheet is a set of boxes, as long as you take your time and practice on the spare sheets we give you, I’m sure you’ll be just fine. Ecoplugs, do I really need to do a ticket I’m only whacking it in with a hammer? If you passed your PA6 between June 1994 and January 2015 you are covered for all elements of PA6 apart from PA6aw which has always been a separate unit, so you wouldn’t have to do Ecoplugs as a separate unit unless you want a definite ticket of proof. If you completed PA6 from February 2015 then you would need to complete Ecoplugs PA6pp as a separate unit if you’re going to apply them. Do I need PPE for Ecoplugs? Do I need a ticket to buy pesticides? No, you don’t need a ticket to buy pesticides, you are breaking the law when you apply the products without a relevant application method. Do I need to MOT spraying equipment? Handheld equipment doesn’t require an external body to carry out an inspection, ensuring the applicator is fit for use is the responsibility of the trained operator using it. Checks should be carried out on a regular basis and a record kept of its condition and repairs undertaken if any. Over 3m by 2020 ensure it has been tested within the last 5 years. After 2020 they need to be tested every 3 years. We recommend Andrew Walburn 07958 351489 for testing. How do I choose the right nozzle? Choice of nozzle is recommended on the product label, so it important to spend a few moments reading through for the best advice. You do also learn more about nozzles on the courses. What is a good nozzle for a boom sprayer? Many people choose an air induction / low drift / pre-orifice nozzle as they allow greater control of drift and a more targeted approach. PA2a covers the operation of mounted, trailed and self-propelled hydraulic nozzle or rotary atomiser of horizontal boom sprayers, from small units such as ATV’s, to tractors and self-propelled units. Weed wipers are different they come under PA2f, operating mounted or trailed wick type applicators. Can I spray on a hot day? It is not advised to spray on hot days, not if it is above 30 degrees. You need to be aware that when it is too hot the plants shut down, they protect themselves by not letting liquids in or out so there is no point wasting time and money spraying when it is hot. Can I spray for other people when I’ve got my ticket? As long as you have the correct application method and the full suite of tickets (not the grandfather option) then yes you can. In fact, it’s a good idea as it helps to recoup some of the associated costs, just be aware that your customers will need the relevant records and paperwork from you. What are the best conditions for spraying? Is there anything I can read before doing the pesticides courses? Do I need an ATV or tractor ticket before doing PA2a? There are no pre-requisites for PA2a, you don’t need to have a tractor driving or ATV ticket to do the course. Subscribe to our mailing list and get interesting information, products, shop offers and updates to your email inbox.